Colorado’s eastern plains are the ideal environment for birding in Colorado, thanks to the astounding variety of birds that make homes in the area's rolling grassland, craggy rimrock, secluded ponds and cool streams edged with cottonwoods and willows. Colorado is home to more than 450 different avian species, many of which are found in the diverse ecosystems just east of the Rocky Mountains. Here, lone falcons share the sky with droves of tiny white-throated swifts, owls snooze inside hollowed trees and prairie chickens strut through vast stretches of golden shortgrass. With such wide-ranging terrain and varied wildlife, the area is a renowned destination for avid birders. 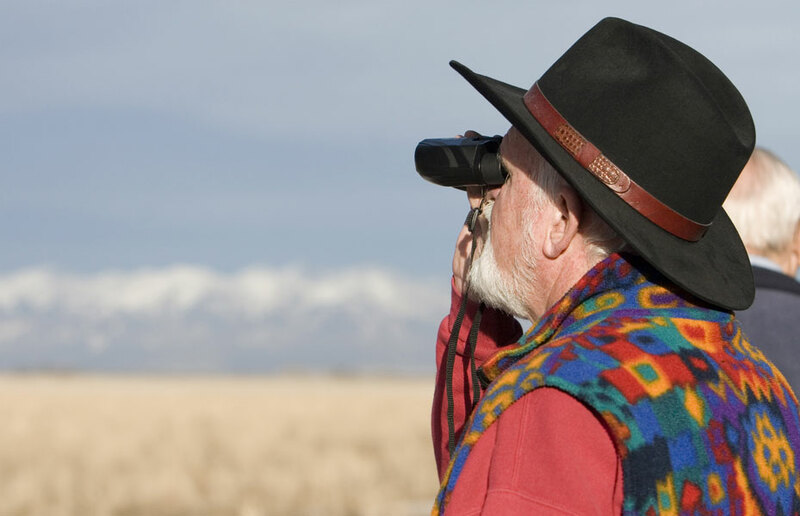 The Colorado Birding Trail is a large-scale initiative that identifies prime birding areas in Colorado, both public and private, where visitors can see the state's beautiful birds. Grab your binoculars and follow the call of the wild with this sampling of birding trails. Water and shorebirds flock to the reservoirs, ponds and lakes bear Burlington yearly. During migration, you’ll see mountain plovers, sandpipers, sandhill cranes and egrets. Winter residents include snow and Ross’s geese and other waterfowl. Keep an eye out for ring-necked pheasants, bald eagles and barn, burrowing and great horned owls. Along the Highway of Legends Scenic Byway and circling the Spanish Peaks, this trail winds through just about every habitat Colorado has to offer. You’ll find everything from waterbirds to marsh-dwellers to dryland and high-elevation species. Loons, swans, gray jays, three-toed woodpeckers, pygmy nuthatches, hepatic tanagers and ptarmigan are just a few of the birds that call this diverse area home. Lesser prairie chickens — a threatened species — are found throughout this trail’s peaceful plains. The Campo Lek site is the only publicly accessible lesser prairie chicken lek (or dancing ground) in the state. Other avian inhabitants include Mississippi kites, red-bellied woodpeckers, Cassin’s sparrows, roadrunners, mountain plovers, rock wrens and a variety of hawks. Head to this collection of birding sites near Fort Morgan to witness the greater prairie chicken’s peculiar mating dance. The area is chock-full of leks (dancing grounds), which offer your best shot at seeing the dynamic springtime ritual. Yucca, cottonwood stands, river bluffs and willows provide shelter for other birds as well, including wild turkeys, meadowlarks, sapsuckers, collared-doves and grackles. Primarily high-plains grassland, this area is habitat to diverse species such as golden eagles, mountain plovers, belted kingfishers, Cassin’s kingbirds, yellow-headed blackbirds and lazuli buntings. Keep an eye out for the jays and bluebirds that nest among stands of Ponderosa pine. The Colorado Springs area offers an enormous variety of native and migratory birds. Varied habitats such as juniper scrub, pinyon forests and alpine tundra shelter myriad species including grouse, ptarmigan, rock wrens, green-tailed and spotted towhee, flammulated and pygmy owls, prairie falcons, woodpeckers, hummingbirds, rosy finches and scaled quail. This trail near Pueblo is home to an array of plovers, from the grassland-loving mountain plovers to the threatened piping and snowy plovers that make their homes on the shores of area lakes. You’ll also find a variety of marsh-dwelling rails, wood ducks, Mississippi kites, endangered least terns and the occasional red-tailed hawk while birding in Colorado's southeast region. Two Buttes — known for its migratory bird population — near La Junta is regarded as one of the best birding areas in the state. Encompassing the John Martin and Indian reservoirs, as well as the Two Buttes State Wildlife Area, the trail is home to Inca doves, green herons, belted kingfishers, blue grosbeaks, northern bobwhites and several raptors including bald and golden eagles and ferruginous hawks. The arroyos, canyons, rimrock, juniper and pinyon of this trail create the ideal setting for dryland species such as the vermillion flycatcher, greater roadrunner, eastern phoebe and ladder-backed woodpecker. Cliff-dwelling raptors like the American kestrel, prairie falcon and great horned owl also inhabit the area. In 2009, the southwest corner of Colorado was added to the state’s birding system, including 13 new trails and more than 200 sites. The area’s varied landscapes — desert cliffs, red rock mesas, mountain meadows, forests, wetlands and alpine tundra — give rise to a tremendous variety of birds. Visit coloradobirdingtrail.com to learn more about these new locations and where to find black swifts, gray vireos, pinyon jays, warblers, boreal owls, least flycatchers, black phoebes, pine grosbeaks, yellow-billed cuckoos, sandhill cranes, chukars, Gunnison sage-grouse and so many more. The site also provides driving routes, maps and more. A grassy valley, red-rock cliffs and ponderosa pines populate this birdwatching wonderland near Fort Collins. The rare American Woodcock, who usually dwell on the East Coast, was recently spotted at Bobcat Ridge. Other winged beauties to look for include golden eagles, grasshopper sparrows, black-chinned hummingbirds and wild turkeys. More than 352 species of birds have been recorded in the Fort Collins area; download the checklist to keep track of the ones you encounter. Birders hoping to catch a glimpse of America’s national symbol flock to the San Luis Valley in the south-central portion of the state. Attracted by abundant waterfowl on the Alamosa and Monte Vista National Wildlife Refuges during the winter months, these remarkable creatures are found nesting in the tops of cottonwood trees and fishing in ponds, wetlands and the Rio Grande River. The eagles also roost here, although less commonly, in the spring and fall. Regardless of the season, would-be eagle watchers should bring binoculars, since birds are wary of humans and keep their distance.